RADAR CHECK: There is a band of heavy showers over east Alabama this afternoon with little movement, generally from Anniston and Oxford down through Munford and Millerville. A few other showers are over west Alabama, south of I-59/20. All of these will fade away once the sun goes down. WEDNESDAY THROUGH THE WEEKEND: Alabama’s weather will trend hotter and drier, despite a major hurricane approaching the Atlantic coast. We will be in the ring of sinking air on the periphery of the system, meaning afternoon showers should be few and far between. The chance of any one spot getting wet each day is in the 10 to 20 percent range; otherwise we are forecasting partly to mostly sunny days and fair nights. Highs will be in the upper 80s Wednesday and close to 90 Thursday through Sunday. The big rain shield associated with Hurricane Florence will remain well northeast of Alabama. NEXT WEEK: Global models suggest the quiet weather continues at least for the first half of next week with only isolated showers and a good supply of sunshine each day. The upper ridge holds, meaning highs will be pretty close to 90. Remember, the first good push of cool air usually arrives in Alabama toward the end of September. 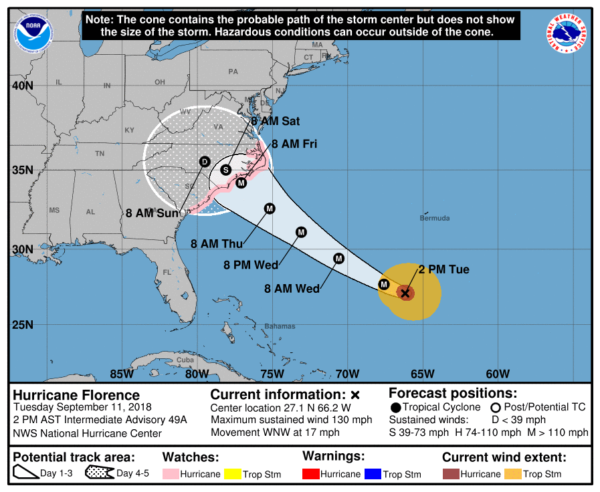 EYES ON FLORENCE: Maximum sustained winds are near 130 mph with higher gusts. Florence is a category 4 hurricane on the Saffir-Simpson Hurricane Wind Scale. Florence is expected to begin re-strengthening this evening and continue a slow strengthening trend for the next day or so. While some weakening is expected on Thursday, Florence is expected to be a dangerous major hurricane through landfall. A life-threatening storm surge is likely along portions of the coastlines of South Carolina, North Carolina and Virginia, and a Storm Surge Watch is in effect for a portion of this area. All interests from South Carolina into the mid-Atlantic region should ensure they have their hurricane plan in place and follow any advice given by local officials. Life-threatening, catastrophic flash flooding and significant river flooding is possible over portions of the Carolinas and Mid-Atlantic states from late this week into early next week, as Florence is expected to slow down as it approaches the coast and moves inland. Damaging hurricane-force winds are likely along portions of the coasts of South Carolina and North Carolina, and a Hurricane Watch is in effect for a part of this area. Damaging winds could also spread well inland into portions of the Carolinas and Virginia. Large swells affecting Bermuda and portions of the U.S. East Coast will continue this week, resulting in life-threatening surf and rip currents. 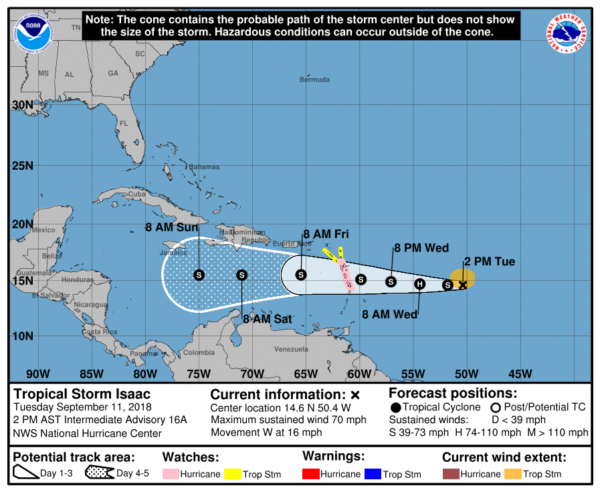 ISAAC: This tropical storm is expected to pass across the Leeward Islands Thursday and into the Caribbean Friday. 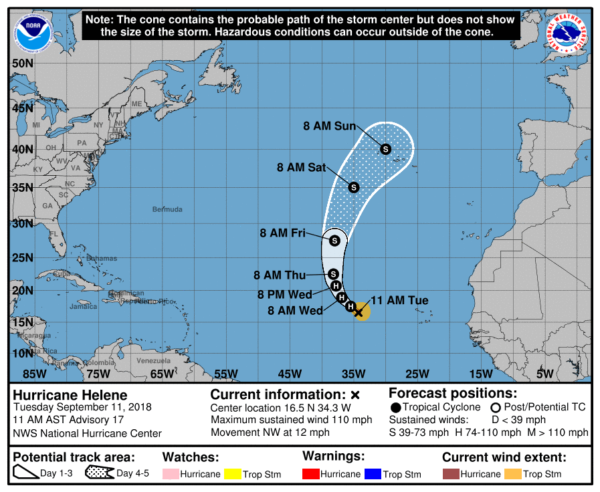 It is too early to determine whether this will move into the Gulf of Mexico or impact any part of the U.S.
HELENE: The hurricane in the far eastern Atlantic is turning north and is no threat to land. 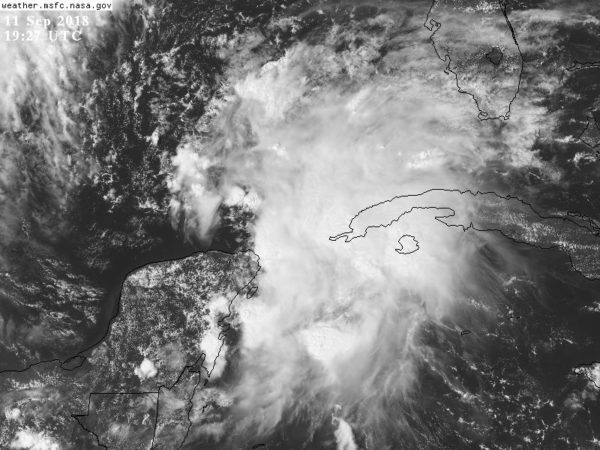 INVEST 95: The wave moving into the southern Gulf of Mexico is now forecast to become a tropical depression within the next 48 hours, possibly becoming Tropical Storm Joyce at some point before moving inland. The main impact here is heavy rain for the Texas Coast late this week; this disturbance is not expected to affect Alabama or the central Gulf Coast.